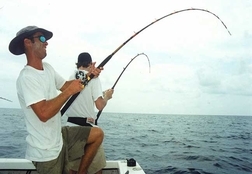 Charter Fishing on the Gulf Coast of Florida and When To Fish! A fish for every season. . . 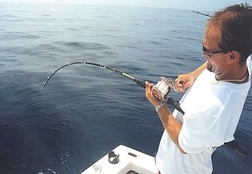 While the exact arrival and departure of seasonal, migratory species likekingfish, cobia and tarpon can vary, we definitely have a full four seasons of fishing action here on the west central Gulf of Florida. Our ever-changing roster of target species typically varies due to the Gulf temperature but some seasons are dictated by fishery laws that seem to change with the blowing of the wind. Be sure to ask Capt. Tom what's in season and what we can legally keep when booking your trip. 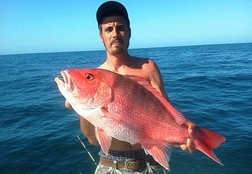 Winter for fishing for Grouper and Snapper! e spent on your winter holes will be the key to a good fishing trip. Spring's when Grouper, Snapper, and Amberjack heat up!! Spring is here, let the fun begin . The cold fronts are becoming fewer and farther between and water temperatures becoming just right. Schools of bait migrate into the area and the hungry game fish will be right behind them. Kingfish, tuna, and cobia are a few of the new arrivals to our area. 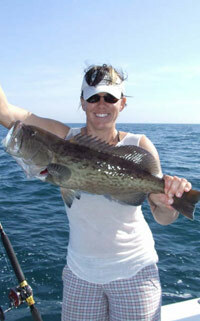 Our locals like grouper, snapper and amberjack are also loving the warming waters. Kings are easy to catch in march, april and may then again in the fall. So there is plenty of great fishing in the spring months of March, april and May and the only trick is figuring out what you want to target to fish. In the months of June July and August there is an occasional kingfish the first half of summer, while Tarpon fishing is in full swing. Snapper is gettin ready to spawn so they school up and eat well making for an easy time to catch them. Baracuda's file in during the springtime and are now all over the Gulf on ledges, wrecks and reefs. Sharks; spinner, nurse, hammerheads, bulls, blacktip, tigers, and more are all moving closer to shore and are just as excited to see the migration of the fish as the fisherman. This said it makes for alot of action in the water and eye witness to the food chain of the deep green Gulf of Mexico. 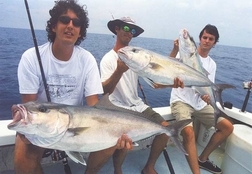 Fall'in for Big Kingfish and Gigantic Grouper! With fall comes the full swing of kingfish. 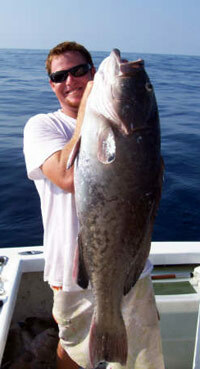 Gag grouper as usual are still in abundance and will start moving into the shallower waters. This makes it really convenient for closer trips filled with more action enabling the captain to fish more spots. Amberjack are offshore in the springs and on the wrecks.